Josh Burnim, one of Idaho's premier outdoor enthusiasts, has decided to get some real life experience in the wild. 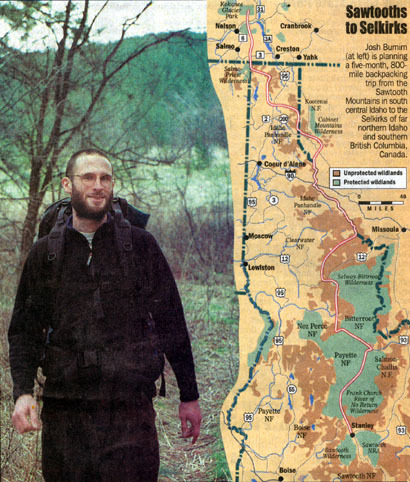 800 miles stand before him with much of the trip consisting of a rugged traverse up and through 2.3 million acres of the Frank Church River of No Return wilderness area, the largest section of wilderness in the United States. Josh will make general observations on human impacts of many specific environments. He will also spend time trying to observe animals such as the grizzly and gray wolf. Youth hikes have also been established along his route to educate the next generation of humans that will all take part in determining the future of wilderness areas. The route that Josh has picked out is a large section of a chain of wild country along the Rockies that is being broken into smaller and smaller pieces. An idea that Josh has studied is the implementation of corridors between these lands. On the website about him there is a disturbing fact saying that 29 mammals have gone extinct due to isolation. Josh is tackling some very important issues and we all can't wait to hear what he has to say and do. This bold endeavor is a monument to the assumption that something is wrong with the picture of mankind's future. The animal inside us has been caught in its own trap and our wounds are seen in the faces of the youth. Our generation has started to see the consequences of our actions. And people like Josh Burnim will provide a healthy sustenance for our growth.